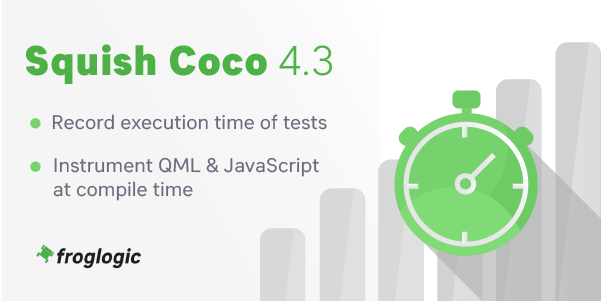 The froglogic team is pleased to announce the release of Squish Coco 4.3. This version introduces new functionality to the CoverageScanner, where users can now record and report the execution time of their program’s tests. This release also provides bug fixes for both the CoverageScanner and the Microsoft Visual Studio Add-In. Squish Coco is a cross-platform and cross-compiler code coverage analysis tool for C, C++, SystemC, C#, Tcl and QML code on a variety of platforms and compilers, including Windows, Linux, macOS, Unix and embedded systems. QA and development teams across a wide-range of industries incorporate Coco into their development processes to quantify test coverage and enhance the quality of their code.